It's VBS week. Which means, (but of course) that I've just finished icing the bottom of my foot. Because I almost always have some sort of physical issue the week of VBS. Last year it was my back. Flat on my back. Intense pain. This year it is just the bottom of my foot. Where I have this weird spot of pain, that is almost bruised looking. It is not in normal foot pain areas. It is not a google-able foot aliment. It hurts when I stand on it. It hurts when I walked. It is almost like a stretchy pain. It's not cool. But it does tangibly remind me that I am a broken vessel. And it is only through my cracks and weakness that Jesus Christ can be seen. I'm seen in my strengths. Christ is seen when I have to rely on Him for sustenance. I am back teaching VBS at our old church. I am so thankful that they still want me to teach VBS there. It is such a privilege to teach. I was doing my regular Bible reading yesterday when I came across this verse. A familiar verse. Does that read rather bold to you? Establish the work of my hands, Lord. In our uber-Christian-ness, we often talk about seeking the Lord's will and direction versus planning our way and asking the Lord to put His stamp of approval on it. Which is as it should be. But, then it makes us read a verse like this and be astounded at Moses' boldness. You got the order a bit backwards there, Mo. It's a bold request. It's a confident request. It's a humble request. If we are seeking the Lord, asking for His leading, I think generally He gives it quite clearly. Often it's the next step. What we'd like is the blueprint for our entire lives. Light for the whole path. But, He leads us step by step. 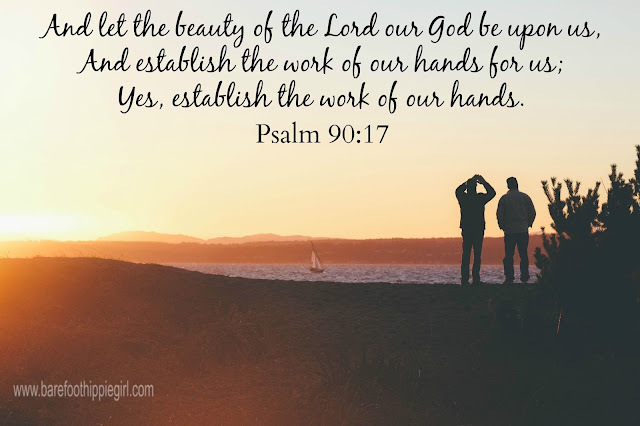 And, as we follow, we can confidently and boldly ask the Lord to establish the work of our hands. We can look back over the scope of our efforts, and ask for the Lord to establish them. Because, the fact of the matter is, we can't establish the work of our hands all on our own. Only God can make our efforts bear fruit. We are in the business of eternal fruit, with an Eternal God whose perspective is eternity. We don't want our efforts to be fruitless or temporary. We want to see lives changed eternally. We want our efforts to last beyond our life span. At least-I do. This is the prayer I am praying for this week. 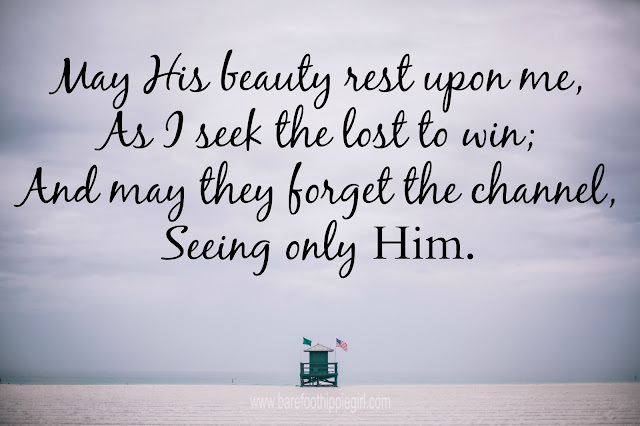 May the beauty of the Lord rest upon me. Establish Thou the work of our hands. I pray with open hands. Extended hands. Empty hands. Will you pray this for me (and my co-workers) this week?